Thanks for popping in. Just got in from a lovely birthday lunch over at Reads in Faversham. Excellent food. Turning 60 at the NEC was fun, but I really wanted to celebrate with the family – especially my parents! Without them I wouldn’t be here! So when they booked a table at Reads, I didn’t have to be asked twice! Every time I have a birthday, which is always once a year, Mum sings to me and then tells me that . “ …..years ago, I vossnt feeling so good. Your Father vos cycling through ze village, to get ze Hebamme (Midwife) in ze dark, and you came in time for breakfast.” Ahhhh……and wherever I have lived in the world over the years, Mum always calls and sings to me. And today, irony of ironies, it is MY daughter Grace’s birthday. So once we had figured out what time it was where she is, and decided it was a respectable enough hour to call, we all facetimed her from the restaurant and guess what?! Yep, ALL sang Happy Birthday to her ! I then proceeded to tell MY story from 29 years ago to the day, that I was living in Nürnberg, Germany, that Grace was a fortnight overdue, and I had packed my overnighter, gone to the clinic, plonked myself in the waiting room, and said “I am not leaving until you get it out of me”. Clearly had had enough! 12 hours later, and an emergency C-Section later, baby Grace was born. Now she lives in New York. Boy oh Boy. History repeating itself, eh. Next Sunday, it’s Mothering Sunday. My turn to fire up the oven and cook a nice meal for everybody. I do enjoy family get togethers and meals, I must say. Long may they continue. My Mum’s favourite flowers are freesias. Ironically, mine too. I drew the freesias pictured below years ago, and we thought it might be a nice gesture to do something special with them, to celebrate Mother’s Day. 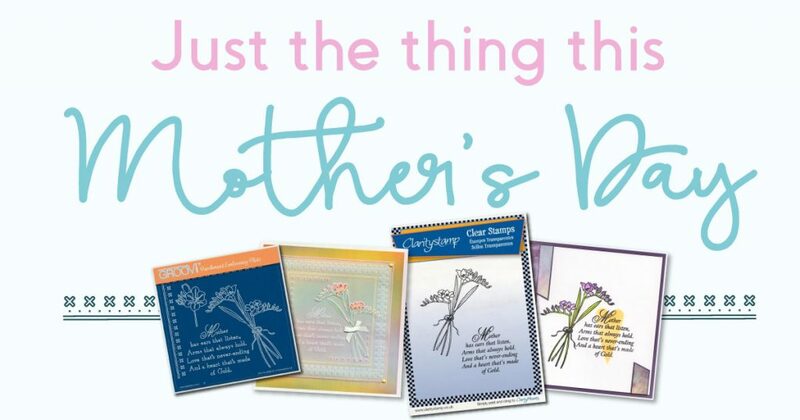 The image below is linked to the Mother’s Day collection page. 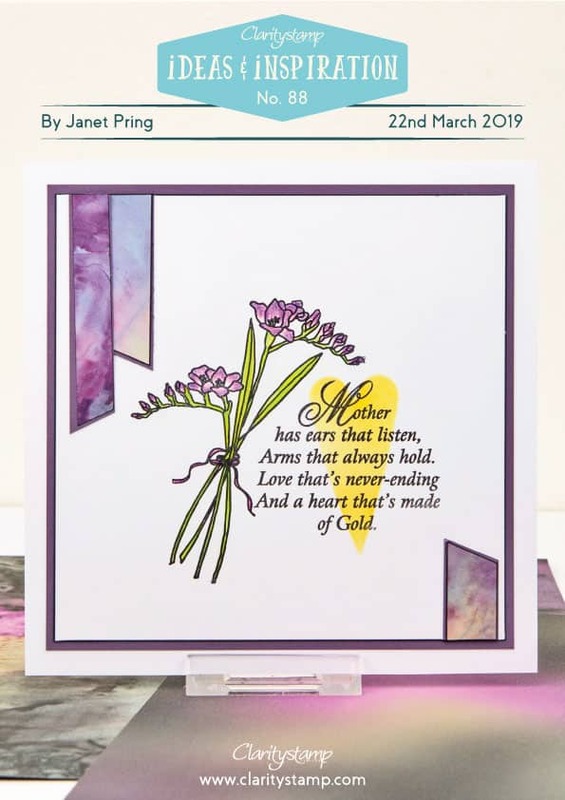 Both the Freesias and Mother Verse Stamp AND the Groovi Plate have 33% off. 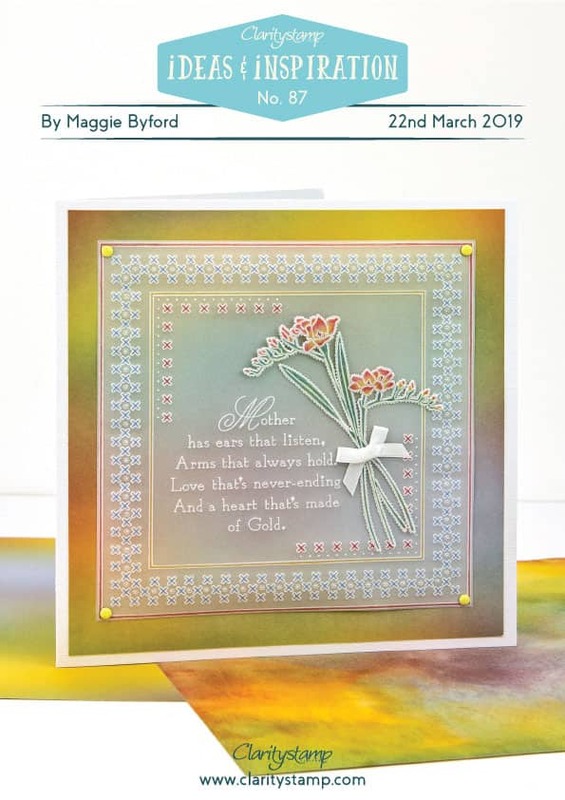 We’ve also picked two lovely projects by Maggie Byford and Janet Pring for you to make, should you treat yourself to the stamps or Groovi plate. The images below are linked to the download sheets. If you click them, you can download each set of instructions. Yes, it has been a good day. The Blackthorn is out in full bloom with its beautiful white flash of blossom along the lanes, and the bright green hawthorn fills all the gaps now. Yep – Spring is sprung. I love being married to a farmer – he teaches me so much! This is this and that is that. And this blossoms first, and that comes later. But that is poisonous, and never put this in the house. Best natural barrier for livestock. All the way home. It’s like having my very own Live Country File. He is great at Clarity, is Dave. He plays a crucial part in the running and building and management – in short, he has adapted amazingly well, looks great in a suit – and I couldn’t do it without him. But he is a farmer in his soul. An outdoor man. It’s in his blood. As it was in his father’s, and his grandfather’s and his great grandfather’s. Not to mention all his aunts and uncles! As Charles Darwin once wrote: It is not the strongest of the species that survives, nor the most intelligent. It is the one that is most adaptable to change. Belated Happy Birthday Barbara! I remember the date as its my husbands birthday on the 13th also I share the year with you. Sharing with family is the best way to celebrate special occasions. Well….it’s No. 1 grandson’s birthday today too- 3 for a whole year from now. He loves tractors – maybe another Dave? And freesias were essential in my wedding bouquet – still have them dried (they were yellow). 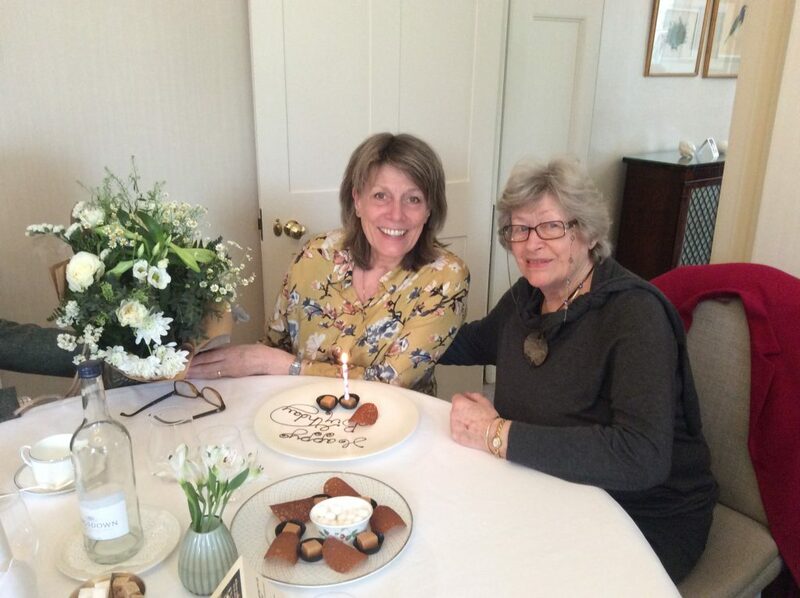 My mum’s birthday would have been this month, you are so lucky to still have your mum around, and so is Grace. 60 is nothing these days, just start ‘throwing’ money at your pension so you can control your future life. It is heartwarming to see and hear about your lovely family. Happy birthday to Grace and thanks to your lovely Mum for looking after you so well. When I started earning money I gave my my mother a card, a box of Black Magic and flowers on Mothering Sunday. She looked at them, said ‘what did you waste your money on that for’ and chucked it all in the bin. Never again!!! So it is with sincerity that I say you are a very lucky lady. Mum had a card with the freshias on last year and she saves them all too. What a lovely picture of you and your mum, she’s looking good isn’t she. It’s lovely you have the story each year and it’s good you are keeping up the tradition with Grace too. Happy birthday Grace. We’ve celebrated my aunt and uncles 60th wedding anniversary today so enjoyed catching up with family. The freesia stamps and groovi are lovely, might go and have a peek. So glad you’ve had such a nice family day. We’ve just got back in from a 3 generation family meal and it was fabulous to catch up with everyone at once. So glad you had such a wonderful family day. Reading what you said about Dave reminds me of Bette Midler’s song “ You are the wind beneath my wings”. Such a beautiful song but it always makes me cry! Well there’s nothing like an extended birthday. My daughter always seems to have a birthday that lasts about a week!! Glad you had a lovely day with your Mum and also both spoke to Grace in NY.